OXFORD, Miss. – After years of development, the University of Mississippi School of Engineering has launched its new biomedical degree program. The Mississippi Institutions of Higher Learning Board of Trustees approved the curriculum for the new major during its November meeting. Students interested in pursuing a Bachelor of Science in Biomedical Engineering are encouraged to apply now for admission for the fall 2017 semester. Biomolecular engineering is a growing discipline at the interface of molecular biology, biophysical chemistry and chemical engineering, whereby students gain expertise developing novel molecular tools. “These tools are used to translate understanding of fundamental principles of physical biochemistry into useful processes, devices, therapies and diagnostics,” Waddell said. Biomedical systems engineering incorporates elements of mechanical engineering design with physiological controls and instrumentation. “Students can employ lessons from bioinstrumentation and systems mechanics to create sensors, test models and build devices to meet currently unmet needs in the medical field,” Waddell explained. Bioinformatics is an interdisciplinary hybrid combining computer science, statistics, mathematics and engineering to analyze and interpret biological data. “Techniques from bioinformatics have helped unlock the human genome, better understand evolutionary biology and are now pivotal in the coming era of ‘big data’ analysis,” he said. In addition to fundamental engineering courses, biomedical engineering students will take courses in biology, chemistry and systems physiology to more effectively apply engineering science to specific medical and industrial needs. The program has been requested by prospective students for several years, said Marni Kendricks, assistant dean for undergraduate academics in the engineering school. The idea and initial work for the new program was initiated by Ramanarayanan “Vish” Viswanathan, chair of the UM Department of Electrical Engineering, and Cheng. Waddell, also a research associate professor of health, exercise science and recreation management at UM, moved into the School of Engineering to facilitate program development in 2013. 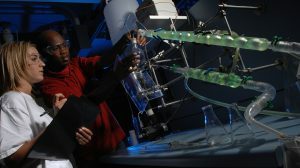 A former postdoctoral researcher at the Georgia Institute of Technology, Waddell earned his doctoral and master’s degrees in biomedical engineering from the University of Texas, and his bachelor’s degree in mechanical engineering from Louisiana State University. Formerly a faculty member at Tulane University, he has an active research program, including projects on stuttering mitigation, functional brain imaging and postural control of gait and locomotion. For more information about UM’s biomedical engineering program, visit https://engineering.olemiss.edu.